$35 Fresh from Market, everyday we will have a fresh $35 bouquet for your home or office! 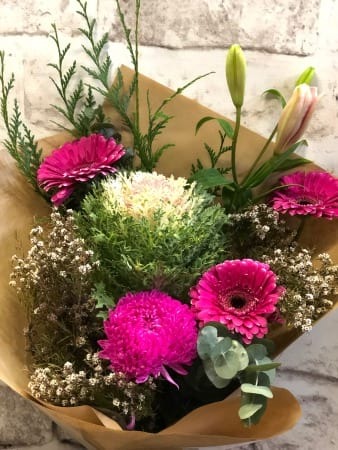 A picture of today’s bouquet can be found at Amaranthine Flowers By Design Facebook page or call our friendly florists, (02) 4947 8005, who can tell you what flowers we are featuring today or which colour palette we are working with. If you are the first order of the day your request might even help Design the Bouquet of the Day! Take a look at our Bouquet of the Day gallery for previous daily specials. If you would like a fresh fragrant bouquet in your home, we have something special everyday, wrapped in simple brown paper and delivered daily. Designed in store to your door and Made With Love. Amaranthine Flowers By Design is a local florist in New Lambton offering same day delivery to all areas of Newcastle and the Hunter Valley including John Hunter Hospital, Charlestown Square, Newcastle Private Hospital, Lake Macquarie Private Hospital and Mater Hospital. We deliver flowers 6 days a week (Monday- Saturday) and Mother’s Day Sunday.